“When We’re Gone” is a rock musical that follows an angst-ridden teen, in plague-ridden, 14th-century London and his desire to make great art in a time of great need. This wildly creative new musical strikes a brilliant balance of modern day characters, a pop-punk score and the life-changing events of 1349. Van Hughes, Matthew Alvin Brown, John Furey, Kat Metcalfe, Derrick Medrano and Antonio Rodriguez performed for this session. The musical’s world premiere showings run from Sept. 26 – Oct. 14 at the Lyric Theatre of Oklahoma. Swing back Wednesday to see a brand new episode with part-time swimsuit model and full-time Okie singer/songwriter John Calvin. On May 21, 2011, Austin-based band The Black Angels visited Oklahoma City for a concert at ACM@UCO Performance Lab. Before its set, I met with the band inside the Spy Van. They performed a playful version of this Velvet Underground song, which is only a small taste of its upcoming episode. Here’s this fancy cover song on Vimeo if that’s your thing. VW vans were made for music. 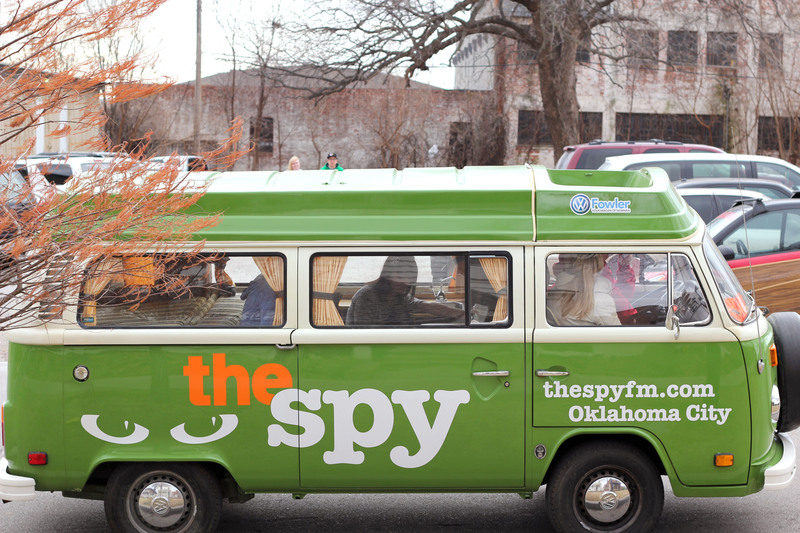 Check out the updated detailing on the side of the Spy Van. It’s the only place to hear the real Spy FM.